This book is derived from lecture notes for a course on Fourier analysis for engineering and science students at the advanced undergraduate or beginning graduate level. Beyond teaching specific topics and techniques—all of which are important in many areas of engineering and science—the author's goal is to help engineering and science students cultivate more advanced mathematical know-how and increase confidence in learning and using mathematics, as well as appreciate the coherence of the subject. He promises the readers a little magic on every page. An instructor's manual for this title is available electronically to those instructors who have adopted the textbook for classroom use. Please send email to textbooks@ams.org for more information. This is a lively introduction to the Fourier Integral...I like this book a lot. I think it's a good choice for students who are interested in signal processing, even though it omits a lot of pure-mathematics topics. A thoroughly enjoyable yet careful mathematical perspective of the underlying concepts and many applications of modern signal analysis. 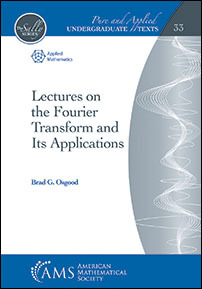 Osgood leads his readers from the basics to the more sophisticated parts of applicable Fourier analysis with a lively style, a light touch on the technicalities, and an eye toward communications engineering. This book should be a great resource for students of mathematics, physics, and engineering alike. Fourier analysis with a swing in its step.